There are a number of opportunities in the Benefice for Children and Young People along with their parents and carers to get involved; the links below provide more information. 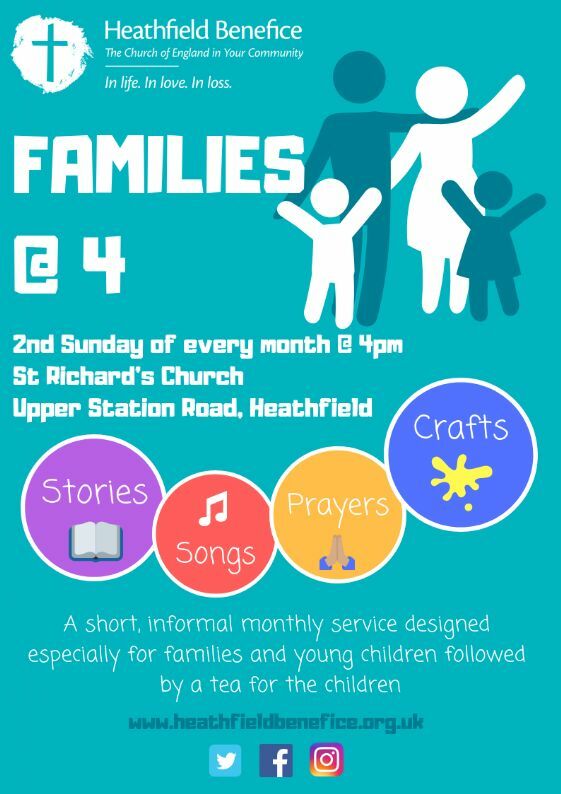 Families @ 4 is our monthly Sunday afternoon service, designed especially for families and young children. It takes place on the 2nd Sunday of every month, 4pm at St Richard's church. Bring your little ones, however many you have, and join us for stories, songs, prayers and craft activities. The service is also followed by a tea for the children prepared by our Mothers' Union Member's. We have now set up a Heathfield Benefice Facebook, Twitter and Instagram account so if you use any of those platforms and would like to keep up to date please do find and follow us!